Talk about foreshadowing... Marvel hid this Black Panther Easter egg in Iron Man 2! Remember when we first saw Black Panther back in Captain America: Civil War? Pretty cool, right? Except it felt a little out of nowhere (other than the quick Wakanda detour in Avengers: Age of Ultron). It turns out, however, that the wheels for T’Challa’s debut have been turning for some time. Since way back in 2010’s Iron Man 2 in fact. The Easter egg in question (H/T Screen Rant) comes towards the very end of the movie, with Nick Fury lecturing Tony Stark while surrounded by various S.H.I.E.L.D holoscreens. They aren’t there just to make the background look a little less dull compared to RDJ’s electric charisma, though. The locations marked out on the world map behind the pair include the location of Thor’s hammer, Hulk’s battle with General Ross, and even Atlantis, hinting at the scrapped Namor movie. Then, it cuts to Africa. The location can be none other than Wakanda. Despite the nation being under a veil of secrecy for some time, it turns out the agency were all-too-aware of T’Challa’s goings-on and possibly even the vibranium stocks. One thing is clear though: Wakanda has been on S.H.I.E.L.D’s radar since before the Avengers Initiative took hold. 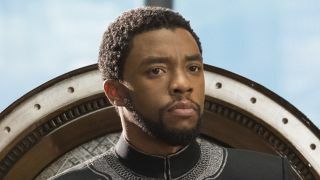 Why Black Panther wasn’t introduced a little sooner is anyone’s guess, but it sure confirms that Marvel are gutsy enough to sow some seeds, give them nearly a decade to ferment, and then unleash them unto the world. Heck, they even have a giant MCU scroll mapping out all of its history. Compared to that, this is small fry, even if it is one of the best blink-and-you’ll-miss it Marvel Easter eggs to date. If you're lucky enough to have already seen Black Panther, check out 6 questions I had after watching Black Panther. If you've still got to wait (you poor thing), let the director whet your appetite by comparing T'Challa to James Bond.